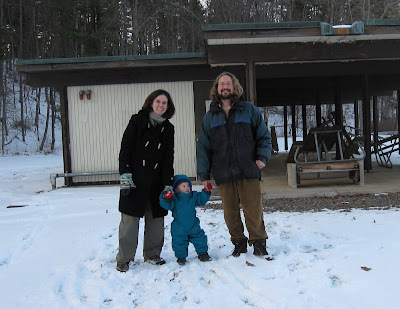 Our friends Sarah, Jeff, and Monroe were in town, and on this sparkling gem of a sunny January day, we decided it was a good day for another outing to yuuup, you guessed it, Chenango Valley State Park. Right as I took this picture, Jeff was warning Marley (the dog) to be careful as she trotted out onto the ice. Something about a picture of the sun setting over a frozen lake. I love those long blue shadows, and the starkness of that trackless frozen expanse. You may remember Monroe as the star of this post, from when Patrick and I journeyed to Vermont this fall. Fun things happen when he's around, that's just the way it is. His parents aren't too bad, either. I truly wish Mr. Danby and I could have been there. The Snow Photos Are Wonderful!